Great Googley moogley! 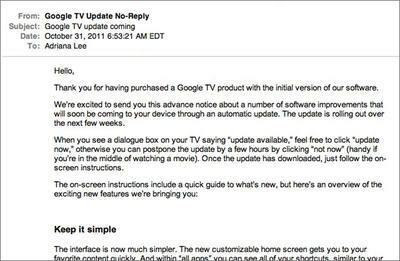 Looks like my Google TV will be all shiny and new soon. I’ve had this Logitech Revue since January and, sad to say, it has been sitting in my entertainment unit, collecting dust since then. But I’ve been waiting in serious anticipation since Google announced plans to finally update the software, imbuing it with UI and search enhancements, as well as the Android Market. And lookie here, I got the email telling me it will be here in the next few weeks. Anyone else get this email? Chime in, so we can do our happy dance together. Text of the message follows. UPDATE: The update has started rolling out today, beginning with Sony Internet TVs, and it will be followed by Logitech Revues at some point after. Let us know if you got the update, you lucky dog, and be sure to tell us what you think of it! Go ahead, make everyone else jealous in the comments below. We’re excited to send you this advance notice about a number of software improvements that will soon be coming to your device through an automatic update. The update is rolling out over the next few weeks. When you see a dialogue box on your TV saying “update available,” feel free to click “update now,” otherwise you can postpone the update by a few hours by clicking “not now” (handy if you’re in the middle of watching a movie). Once the update has downloaded, just follow the on-screen instructions. The interface is now much simpler. The new customizable home screen gets you to your favorite content quickly. And within “all apps” you can see all of your shortcuts, similar to your Android phone or tablet. We’ve improved search across the board for content from live TV, Netflix, YouTube, HBO GO, and more. But what if you don’t know what to search for? There’s now an app called “TV & Movies” that let’s you easily browse through 80,000 movies and TV episodes across cable or satellite, Netflix, Amazon, YouTube, and many other sites. If you’ve opted in to recommendations, we can better predict what you want to watch next. We’re launching a new YouTube experience specifically built for Google TV. It is now fast and easy to get to your favorite HD-quality YouTube entertainment. And we’ve integrated YouTube more closely with Google TV search, so that you can turn virtually any topic – mountain biking, cooking, etc. – into a channel. We are opening up the TV to the creativity of content creators large and small through Android Market. 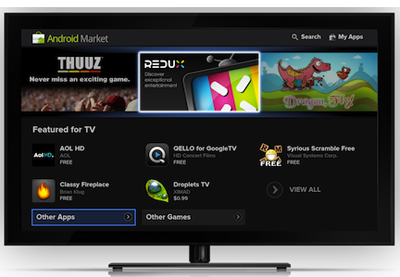 Android developers can now bring existing mobile apps or entirely new ones to TV. Initially, the number of apps won’t be large – for example, apps requiring a touch screen, GPS, or telephony won’t show up – but 50 developers have seeded the Market with some cool and useful apps for the TV. We’re excited to see the number of apps grow.